RESERVED A New Map of the East Indies... in Autumn Sale! Size: 15 x 19 inches. Full title: ''A New Map of the East Indies Taken from Mr. de Fer's Map of Asia, Shewing their Cheif Divisions, Cities, Towns, Ports, Rivers, Mountains Etc. Dedicated to His Highness William Duke of Glocester". 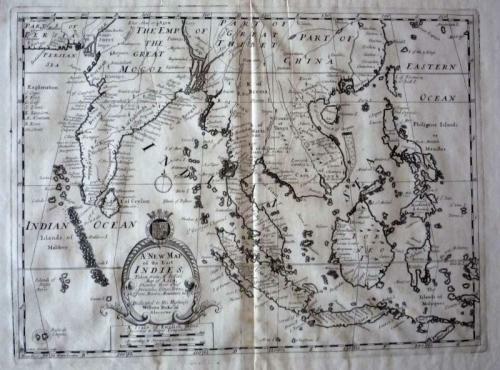 A rare and decorative map of the East Indies by the English cartographer Edward Wells. An interesting feature is India that is shown very thin, although the general area appears accurate to Siam, Indonesia to Timor, north through Borneo and the Philippines. Edward Wells was a teacher of mathematics and geography at Christchurch College of Oxford University. The map is dedicated to his Highness William, Duke of Gloucester, heir to the throne, who began his studies at Christchurch in 1700 at the age of 11. He died at the age of 13, shortly after this map was issued. The map is in very good condition with a strong impression and only some very slight aging at the fold. A few minor creases and slight overall toning.